Female Red-billed Pied Tanager Lamprospiza melanoleuca on nest, Museu da Amazônia, Manaus, Amazonas, Brazil, January 2017 (Renata da Silva Xavier). From Bull. B.O.C. 137(3): 238. BOC Bulletin 137, No. 3 (September 2017) is now available for viewing or download from this website. You can download a PDF for the whole issue or PDFs for individual papers. This issue contains nine papers of wide interest from A new Peruvian locality for Scimitar-winged Piha Lipaugus uropygialis, with the first description of flight display and other natural history notes by Daniel F. Lane & Tatiana Pequeño, to Observations of five little-known tubenoses from Melanesia in January 2017 by Robert L. Flood, Angus C. Wilson & Kirk Zufelt. 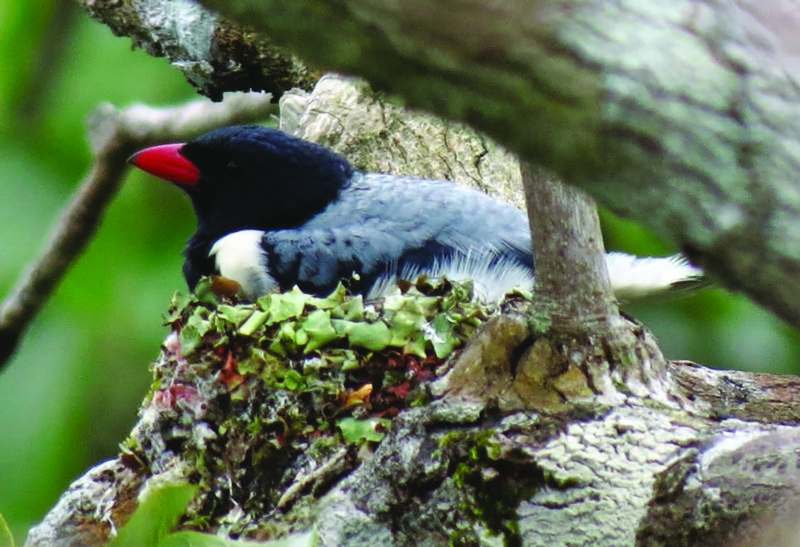 Short papers include First data on breeding ecology of Red-billed Pied Tanager Lamprospiza melanoleuca, including the nest and egg by Tomaz Nascimento de Melo & Renata da Silva Xavier (see featured photo above).